After the CoL meeting this week and listening to Rebecca from Woolf Fisher talk about how to structure our inquiries so that each step is clear and it is obvious what is being done, how it is being done and how it will be measured, I have tried to break apart my inquiry into the steps needed. Blog post about my main take outs from this meeting here. I put together my thoughts about my inquiry using a Google Drawing and sent it to +Rebecca Jesson for feedback and suggestions. The feedback I got back was very helpful in tidying up the right hand side of the diagram and clarifying how and what it will look like in practice. Comparison of before, during and after writing samples. what aspects would you expect your changed teaching to impact on, how? How they respond to questions, verbally and in writing, during the ongoing lessons. How would this relate to the writing? What would you look for? Google Plus community use and how they respond to each others posts - analysis and feedback to each other. What would you look for in here? How would it relate to the NCEA breakdowns? Would this be similar to the verbal things you look for? 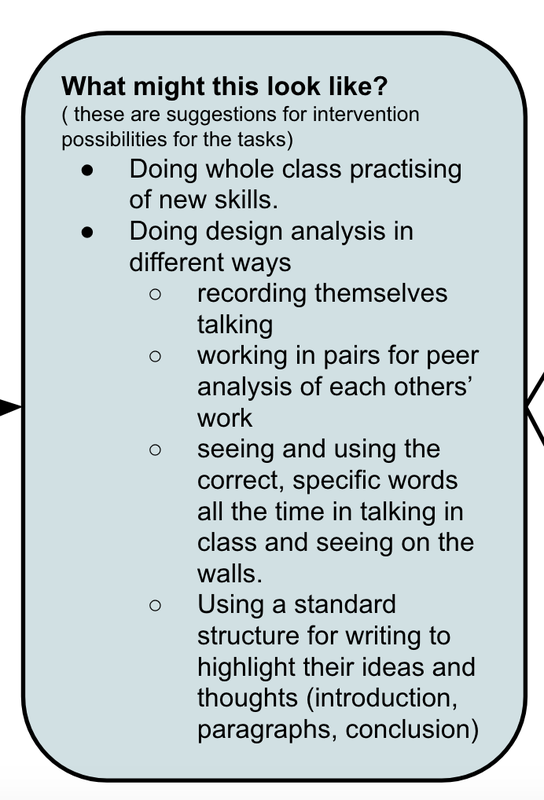 NCEA standard breakdowns - how are they approaching the different levels (A,M,E) Again, what would you look for in here? How would it relate to the other assessments? How does it relate to the conversations? This has been an extremely useful exercise as it has started to really nail down in my own mind what I am trying to achieve this year ( I say started, as I have called this diagram Number 1. I am sure there will be changes and improvements and more versions as more feedback and suggestions come in from others and as I try things myself). 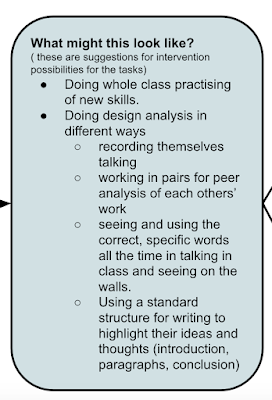 After feedback from +Anne Sinclair, I have added another column next to the intervention box for possibilities of what tasks could look like. I feel like this could be a never ending list as I keep thinking of things to try. A thought I had was around what you are doing in terms of your pedagogy and practice to foster and enrich the vocab acquisition. What may engage them at a deeper level other than just exercises. Can you think of other strategies which may challenge them more and push them to speak, act, write, question, query, challenge each other. I think you are going to get a lot more ’talk’ happening in a social context like working in teams or pairs. Thanks Robyn. It was a useful exercise for me and my own understanding to be honest. Doing a diagram is the only way to get the jumbled mess out of my own head! What am I leaning from AsTTLe marking PD? Explanation Writing - Analysis of Structure.